There’s a reason I am writing it. A huge reason. 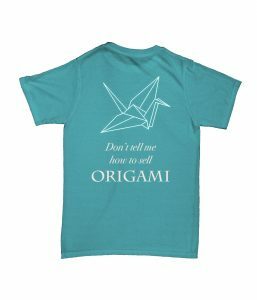 I am seriously thinking about making a T-shirt with ‘don’t tell me how to sell origami please!’ on it. Every second person that learns about my origami skills tries to discuss how I could sell it. If you think that happened after I’ve become a master you are wrong. This all ‘you need to sell it‘ thing started way before. It started at the time my works didn’t look that cool. It started with my parents actually. Everybody seeing this huge amount of pretty folded stuff in my room would say “Oh, so cute, you need to sell it!”. The reason I decided to write this is, of course, not my own experience. I get at least 1 email per month asking me how to sell origami or asking for a permission to sell my models or about the tips about selling origami. And I am just a bit tired to answer the same thing over and over again. I am a bad sales person, I know it, it’s not the thing I am good at. I am a lot better in origami than in sales. So let’s imagine this is the main reason for my origami does not sell well. But I need to point it out that I do not know anybody who would make stable money from selling origami. I do not mean the true Masters of origami like Eric Joisel and maybe a couple of other Masters. You could count those people with one hand’s fingers. I mean that average good level folders who fold other’s people’s models don’t sell them regularly. Even if you get some order or somebody buys your origami for a reasonable price, it’s a single sale. It is usually one of a kind thing. And it is not going to be a stable income source. If you do not believe me you can go at etsy and find a lot of origami for sale there. Does it really sell? Not that much… Etsy is a great tool to see what actually sells and at what price. Some people would price their origami $$$ but there won’t be any constant sales (if any at all). Solution number one for getting income is … trying to have better education and/or job. I write this because I am usually asked by the people who are students and try to make it an income. It will be much more profitable for your future to invest in education, really. The thing that you may try and that worked for me is to donate your origami to some charity. Oh yes, you don’t get the money. But you can watch people buying your creations for a good money and you can feel that money going for a good thing. I had donated a bunch of my kusudamas to Paper for Water charity (https://www.paperforwater.org/). 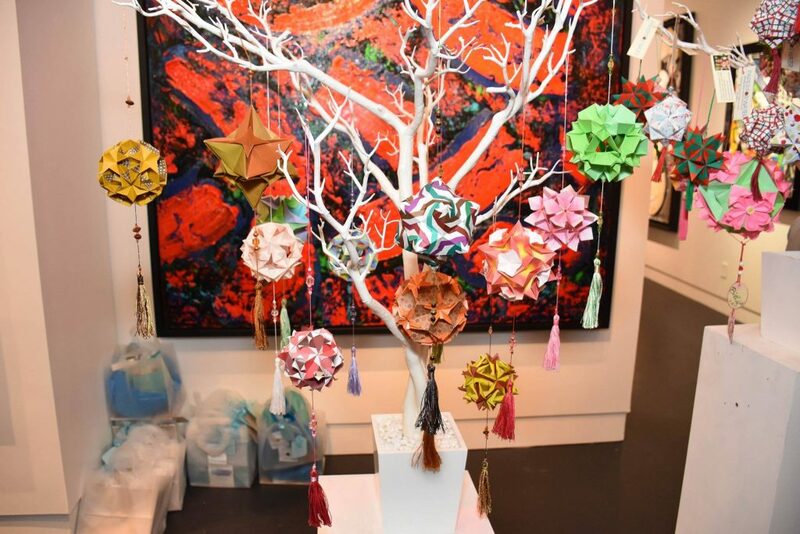 This is the charity that sells donated origami and builds drinking wells all around the globe in the places where people lack access to clean drinking water. Besides the fact they are wonderful people, they really know how to sell origami! And I was so happy knowing that my origami can do good for people. I’ve got a lot of satisfaction when I’ve seen it. And oh yes, I’ve never seen anyone else selling modular origami balls for $$$. It’s hard to sell and make a living, even though I sell what I’ve already done, to the people who offer me yo but It, or gifts shops, but It is just enough to get more paper! Most of the people I know making money off origami are doing high end sales or teaching it. I’m not sure anyone is making a comfortable living at it. I make exhibition since i create models : 17 years , and sell since this time but at this time i have a “true job”. Finally i chose a fulfilment life by becoming origami artist pro since 4 years now. At the beginning with workshops , my first envy is to create unique piece and sell them , but a philosophic problem came to me : i sold my “children” . Finaly i found the good way stop selling my children and sell the exhibition and it works . But you explained it well by push on you need to have a quality works pratically sculptural works and the improvment . why can’t you donate those models in cartons? Well, I don’t sell origami, but, of course, I hear this advise from time to time 😉 And I still thinking about it. Not about making good money, of course, but.. yes, get rid of folded stuff and, may be, cover expenses of my hobby: buy paper, books, visit conventions.. What do you think, is this realistic? The charity is very good idea! I’ll do it if I find something in the vicinity. “they really know how to sell origami” – well.. I think it’s because people who buy those balls are not buying, but donating. They pay not for folded things but feeling they make a good thing. Buying paper seems doable to me, however conventions are very expensive (if you add up registration fees + hotel + tickets). From writing books it could be done, but not from selling origami, I guess. 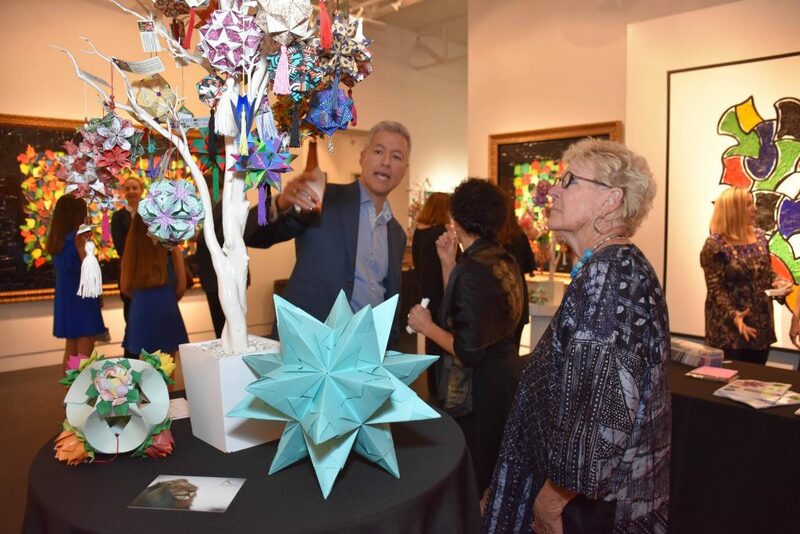 If I may, I suggest a slight amendment to the title: Why selling origami is a bad idea (for me).” For some folks, it is a very good idea! But it’s certainly not for everyone, both for the reasons you outline, and because going down that path requires that one deal with questions of pricing, making one’s accessible vs making a living, how much or whether you let the market affect what art you do, etc. In other words, you need to deal with a lot of non-origami stuff to be successful at it. For the past 15 years or so, selling origami has been a big chunk of my livelihood (how big a chunk depending on how broadly one interprets the term “origami”), and it’s been both artistically and intellectually satisfying. 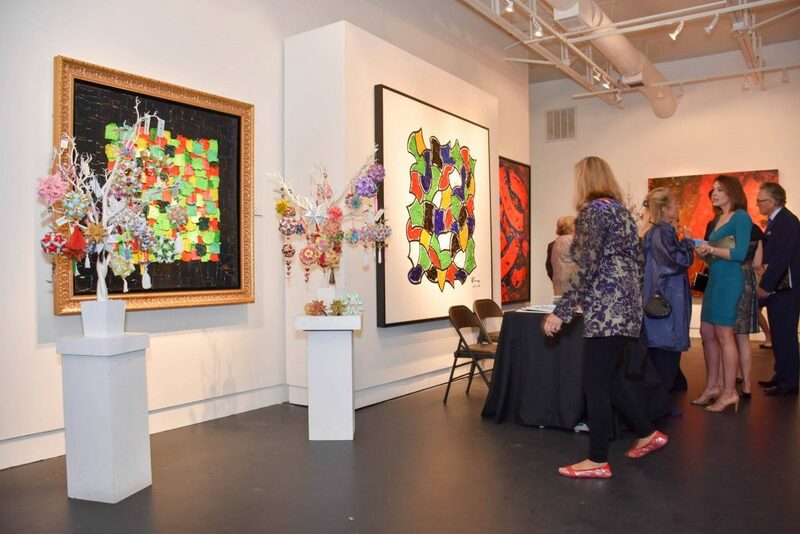 But different folks seek different things from their art (and their livelihood), so rather than trying to give a blanket statement of “you should” or “you shouldn’t,” I try to explain the tradeoffs to folks so they can make that decision for themselves. Oh, and I, too, get lots of emails and suggestions of the form “you should sell X kind of origami” (or “you should fold X”). It happens often enough that I’ve developed a stock reply: I thank them for the suggestion, and say I’ll consider it. Which is true, and it then lets us move on to other topics. Hi Robert! I am really glad to have you in this discussion 😉 And the opposite (to mine) opinions are more than welcome! That’s exactly what makes a discussion discussion. I’ve been doing origami for the past 24 years, since teaching myself at 5 years old, so finding this article certainly brought back memories. When I was in grade school, I started selling modular balls at an art gallery. It was fun to make them in my free time, ship them off, and get a check in the mail from time to time. Bringing in $50 here and there was a big deal for me as a kid, so I started spending more time creating with intent to sell. I started doing a couple art shows and began to seeing how much went into fees and learned about how poorly I could sell my work. In high school, I got to the point where people were requesting things, but I was still selling myself short in how much time went into each piece. This stress pushed me away from origami some, and I realized that much of the reason I enjoyed making this art was for intrinsic reasons, not external monetary ones. I stopped selling my art entirely and began to enjoy it again. I can agree with your statement about investing in other professions, because in college, I was able to use what I’ve learned through origami and take it in another direction — product design. Nowadays, I use product design work as income and still make origami for fun. I still don’t sell my work, but instead gift them to friends, people who have helped me in some way, or as trade for art other friends make. This helps me remove any stress of putting monetary value to my work and eliminated my dependency on the art that I enjoy doing for fun. It’s indeed a huge issue with undercounting your time while doing origami. Especially with complex modulars. And also people won’t count the time they need to photograph, post it somewhere, advertise etc. I would also like to add one story where I commissioned some modulars. The trick was that the client wanted them made from white plain paper (and the client is always right). So I folded plain printer paper, several complex modulars in a short period of time (deadline). At some point I understood that I completely dislike this plain white paper and I am nearly ready to pay someone else to finish that :D. If it was no deadline or no obligation to fold something very specific I would enjoy the process a lot more. But when you start working it might become work, not hobby, with all the unpleasant ‘features’ of work. Hi Kate. I agree with Robert when he clarifies that the title of the post should say “for me”. I have folded origami for 22 years and in 2010 I opened my origami selling business. At first I did not have many sales but over time I was acquiring knowledge to reach my audience. Selling is not something that happens from one day to another, but a process that takes many years of practice. How much did I sell? Enough to live, since it was my only money entry for 6 years. Last year I decided to close my sales business, not for lack of demand, but because I wanted to dedicate myself to teaching others how to sell. In addition to the classes that I give and to dedicate time to my collection of own models that little by little grows. In the first lines of your post you mention that you do not know how to sell. Well, that’s the reason you did not sell. An origami business requires a full time job to actually generate money. The people I teach them how to sell are women between the ages of 30 and 45, with studies and work. Many of them mothers looking to take a job from home. As the Japanese proverb says: If no one can do it, it means that I must be the first to do so. Of course if I am writing in my blog I write about me and my experience. I hoped it would be understandable. There’s no universal truth anyway to pretend you know it (in almost any field of knowledge except, maybe, pure math). And I hope that people now can read opposite comments and make up their minds. > An origami business requires a full time job to actually generate money. Yes I believe that. And does not it become a job then? In terms that you have the same downsides as any other job has. It’s no more just a hobby. You start getting obligations. It’s important to understand that. And speaking of a full time jobs we get to the point that (my) regular full time job is paid incomparable to origami. Do you have any page about your teaching so that I could forward those home-mothers asking me about selling origami to you? I think you can post it here. Hi, of course I understand that in your blog write about your personal experiences. I find this thread very interesting, especially because of the discussion that has been built around it and the diversity of opinions. I had an online business selling personalised folded cards (kaleidoscope folding) and instruction kits for same. I found there was little profit or satisfaction in this ….. although some customers were very complimentary. It was very time consuming ordering materials and arranging posting. 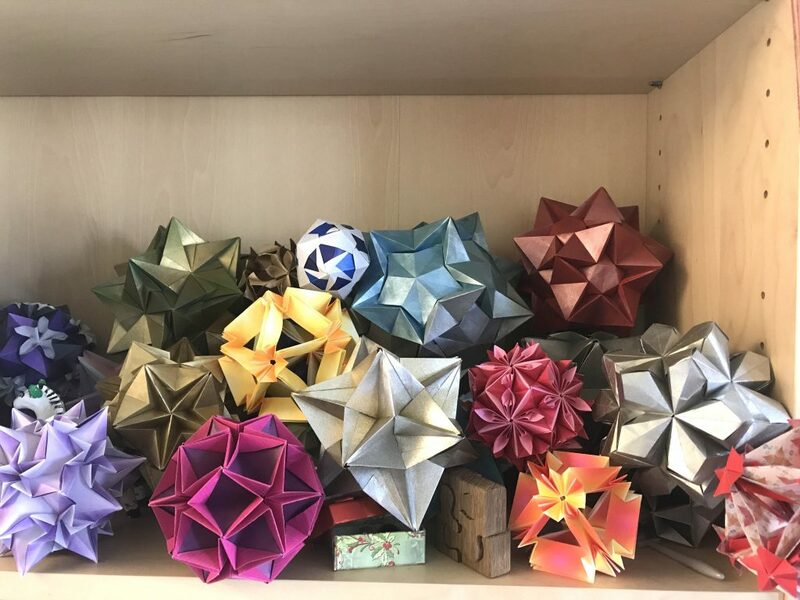 I found Kusudama making very useful in my Social Services work running leisure groups for adults with a variety of challenging behaviour and special needs: Everyone could tackle the making of one simple unit….while the more able or staff could handle some assembly…. a valuable team building exercise. I’ve also run various one-off group sessions in friends homes and for charity. But the time and prep these is considerable. I feel Kusudama is always well received as a present …… best use! I have been folding for many years (I am not a master at it but all my friends think that I am) and I get asked the same question contantly… I fold because I enjoy it and I only fold when I feel like folding, I fold with what ever paper at hand (most of the time with discarded tickets, receipt or old magazines). I give away all of my origami to people, I work in public transport and sometimes I see parents with children that are stressed (as a parent my self I know that is very stressful) and by giving them a piece of origami they will get distracted and relaxed giving the parents and other people some peace of mind on the journey . I got into origami as kid when someone taught me the paper crane and that got me started… by giving other kids origami it will trigger their interest in the art of paper folding. I fold because its a hobby and I enjoy it, and when it becomes a job I don’t think I will enjoy it as much, origami is still one of few refuges I go to when I need to get away from stresses of life the last thing I need is stress to creep into my refuge. I agree. Commercial projects are way more stressful for me than just folding. Because you usually have requirements, deadlines and responsibility. Which makes it job and less fun. I’ve been selling Origami at farmers markets in Hawai’i for the past 10 years. I fold traditional models (mostly cranes) while in transit or during my free time. During the weekends as a kid I used to walk around the farmers markets with strings of cranes. Now that I’m older I’ve progressed to my own booth, several variations of products, gallery exposure & wholesale clients. I’m not making a full time living wage off of my origami alone, but it’s certainly a nice side hustle. Currently I’m making anywhere from $50 – $200 a week. I am glad for you! How much time do you spend for folding what you sell and also for selling that?